Just as I deliver the ball to the player in line the two girls simultaneously and randomly raise either one hand or two. The player receiving the feed must add up the total number of hands raised and if that number is odd clear the ball to the player on my left and if it is even clear to the player on my right. I am still wondering whether this should have been cleared with some kind of institutional review board. Did they play with “chained” dollars? Loyal reader “Mr. H” points us to some recent improbable research from the Journal of Economic Behavior and Organization (JEBO*) that analyzes the classic prisoners’ dilemma game. The big story here is that the authors ran the experiments using actual prisoners! Specifically, they surveyed about 92 women from a prison “für Frauen” along with 90 college students as a control group, and they found that prisoners were actually more likely to cooperate (keep their mouths’ shut) in some situations. We compare female inmates and students in a simultaneous and a sequential Prisoner’s Dilemma. In the simultaneous Prisoner’s Dilemma, the cooperation rate among inmates exceeds the rate of cooperating students. In the conventional setup, of course, cooperation means not ratting out your criminal partner. So what do the differential rates tell you — snitches get stitches? Relative to the simultaneous dilemma, cooperation among first-movers in the sequential Prisoner’s Dilemma increases for students, but not for inmates. Students and inmates behave identically as second movers. Hence, we find a similar and significant fraction of inmates and students to hold social preferences. Now what does that tell you? I’m not sure. * For those of you keeping track, that’s pronounced “Gee bow”. One of my favorite features at the Cheap Talk blog is Consider the Equilibrium, where, as you might expect, the authors consider the equilibrium outcome in scenarios ranging from bike sprinting to inferring the quality of Asian restaraunts. This week they tackle the dicey problem of dual-zone vehicle climate controls. Oh, and coincidentally enough, I was telling my Econ 280 class yesterday that men should ride shotgun because she is safer. I talk the talk, but do I ride the ride? Great post at Cheap Talk about beer pricing and Anheuser-Busch’s thwarted attempt to acquire Grupo Modelo, based on a New York Times article. For decades, [the Justice Department] argue[s], Anheuser-Busch has been employing what game theorists call a “trigger strategy,” something like the beer equivalent of the Mutually Assured Destruction Doctrine. Anheuser-Busch signals to its competitors that if they lower their prices, it will start a vicious retail war…. Budweiser’s trigger strategy has been thwarted, though, by what game theorists call a “rogue player.” When Bud and Coors raise their prices, Grupo Modelo’s Corona does not. Definitely worth reading, especially if you spent the last term engrossed in the ins-and-outs of the beer industry. See pages 168-170 of Tremblay & Tremblay for some illuminating background. [H]e is surrounded by generations of students and researchers, some of them computer scientists, working on all kinds of cutting-edge topics. These include circuit breakers (forced trading halts) in panicked markets, random assignments in long waiting lines, school choice, new wrinkles in the auction of broadcast spectrum rights, corporate restructuring refinements and all manner of other market processes, anything, in other words, that might be improved by a little engineering. As for Shapley, I didn’t know much about him beyond my familiarity with the Shapley Value. It turns out Shapley kept rather spectacular company, including the likes of John Von Neumann and John Nash. Robert Aumann called him the “greatest mathematical game theorist.” Wow. You’ll definitely learn something from reading this piece. 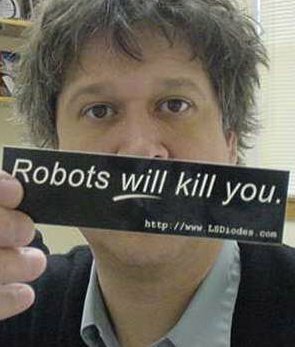 We occasionally will warn you of the many mysteries and potential dangers of robot nation. Today we consider a simple battle of wits in a game of rock, paper, scissors with a robot opponent. Back in the day, you could get a fair shake. But today I refer you to the ever-awesome Kottke website, where we observe a much different outcome. Here it goes: Rock, paper, scissors,…. shoot, I lost again. Is Game Theory relevant? Ariel Rubenstein says no, but he really means yes. Those guys at Cheap Talk are hilarious. And, looking for that perfect graduation gift? Download all of Professor Rubenstein’s books! Here is the latest installment of “Consider the Equilibrium,” Jeff Ely’s fun little series at Cheap Talk. Those of you in Econ 225 are about to start studying game theory—this video gives you a preview of the kinds of fun we are about to have. Some people say that game theorists are afraid to tackle the tough questions. I wonder what those people are saying now? The issue of whether the toilet seat should be left up or down after use seemingly generates a lot of passion among the parties concerned, however, scientific inquiries into the matter are almost non-existent…. In this paper, we internalize the cost of yelling and model the conflict as a non-cooperative game between two species, males and females.We find that the social norm of leaving the toilet seat down is inefficient. However, to our dismay, we also find that the social norm of always leaving the toilet seat down after use is not only a Nash equilibrium in pure strategies but is also trembling-hand perfect. So, we can complain all we like, but this norm is not likely to go away. Of course, that’s hardly the last word on the subject. Indeed, this piece with a starkly different conclusion found its way into Economic Inquiry. This paper develops an economic analysis of the toilet seat etiquette. I investigate whether there is any efficiency justification for the presumption that men should leave the toilet seat down after use. I find that the down rule is inefficient unless there is a large asymmetry in the inconvenience costs of shifting the position of the toilet seat across genders. I show that the selfish or the status quo rule that leaves the toilet seat in the position used dominates the down rule in a wide range of parameter spaces including the case where the inconvenience costs are the same. I guess there’s nothing left to do but wait for the econometric analysis. There seems to be a very tumultuous situation in Egypt. In the face of mass protests being labeled “Angry Friday,” Jeff at the Cheap Talk blog and Tyler Cowen at Marginal Revolution assess the strategic implications for both protesters and for the government. The decision to get out and protest is a strategic one. It’s privately costly and it pays off only if there is a critical mass of others who make the same commitment. It can be very costly if that critical mass doesn’t materialize. Communications networks affect coordination. Before committing yourself you can talk to others, check Facebook and Twitter, and try to gauge the momentum of the protest. These media aggregate private information about the rewards to a protest but its important to remember that this cuts two ways. The warden admits three prisoners into his chambers. He tells them, “One of you fellas is going to have a chance to get out. Here’s the deal. He blindfolds them and puts a hat on each prisoner. They’re led out of the room in single file. When the blindfolds are removed, the guy in the back can see the two people in front of him, the guy in the middle can see the one guy in front of him, and the guy in front can see nobody. Don’t forget, there are three white hats and two black hats available. The fellow in back says nothing. He doesn’t know. The fellow in the middle is asked the same question. He is unable to answer. Those of you who have taken Advanced Game Theory will be done with this before I can finish this sentence. And if you haven’t taken that course yet and enjoy this sort of thing, you should definitely take Advanced Game Theory (Econ 410) this coming Spring, where we ponder some similar puzzles (and, yes, I do know that the course title has “& Applications” in it). All this goes under the heading Interactive Epistemology, and it is generally as complicated as it sounds. But also very important, as the surprising answer to this puzzle will no doubt show you. A nice late edition to the Econ 300 final questions on tuna fish. Is this efficient or inefficient? From the Kids Prefer Cheese blog, we have a story older than the hills — mackerel in a ball. So you think the little fishies are cooperating? 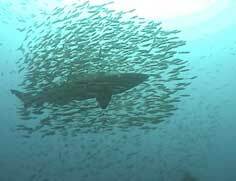 Not so much… It’s actually a straightforward prisoners’ dilemma problem: If all the little fish would scatter at the same moment, most would escape, because there are so many and the predators are few. But if I expect YOU to take off, I should stay in the ball. One or two fish trying to escape will be caught. And if I expect you to stay in the ball…I should STILL stay in the ball. Plenty of seats still available.